One of the things I love to do after 35 years of magic-shows, (3 or 4,000 of them!) are shows for kids! That includes special events/"family" shows as well as birthday parties! 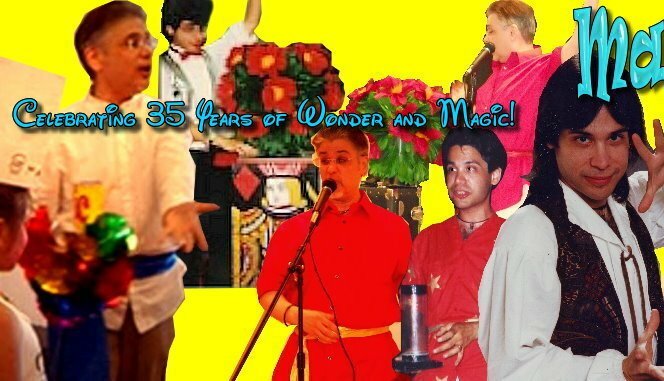 I didn't start off as a kids' magician after relocating to Winnipeg, Canada from Toronto in 1981, although I had some birthday-party shows under my belt by then. My goal was to perform mainly for adult audiences in bars and lounges, with close-up magic, as well as a "platform" or "cabaret" show consisting mainly of "pseudo-psychic", a.k.a. "Mentalism" effects. I had doves in my stage-show, appearing and color-changing canes and candles, but I especially loved doing card-tricks on stage in which I was apparently "reading" spectators' minds. I must admit, I borrowed some effects from Kreskin's act, including doing "audience readings": providing specific names, dates, etc. to audience members while sitting on stage. Afterwards, I would call out a dozen or so playing cards that an audience assistant had randomly selected from a pack of cards with my back to them. This was all so easy for me to do and required no prior set-up, (except for the doves, canes and candles segments) and the audience reactions were great. The climax to this "adult" show was my vanishing Coke bottle, which visibly vanished before their eyes with a wave of my magic "bang wand": the wand shot out a fire flash-ball several feet away, adding a dramatic touch to a relatively tame but visual illusion. I had "after hour" regulars to this bar called "September's" complain if I left out any of these tricks, asking for the Coke-bottle trick, or this or that. They all asked for business cards from me, for yes, their kids' birthday parties! Everywhere I performed for adults, they wanted me for their kids' parties! I decided to give in to this potential "gold mine", performing an average of 3-4 shows on a Saturday, and 3-6 on a Sunday for many years, including corporate family parties and county fairs; this helped me to buy my first home! I must admit, I didn't enjoy kids at first, nor did I ever choose to have my own children, (I love my 35-year-old step-kids, however, from my second marriage!) but performing primarily for thousands of kids' events made me grow to love them, and vice-versa! I enjoyed their enthusiasm, honesty, and humor, and they enjoyed my silliness and magic-tricks! I made them laugh, I made them sing, and I believe I brought a sense of wonder into their lives, which I still hear today about from them, themselves now parents! Earlier tonight, I performed at a birthday party at our local community centre; I'm their "go-to" magician, when I'm available! At age 59, (I started at 25) I choose to no longer do as many shows: four or less a month is more than enough! I've recently "re-cycled" one of my four kids' shows since I'm starting to get some of the same kids attend these parties and special events at the community centre. So the same, time-tested show ("A") that I've been mainly doing for almost 20 years goes into the magic-trunk, and out from my oversized leather doctor's bag comes show "B", also pretty strong, but less familiar to me, since it was my 1980's "go-to" act, and the other one "A" was my 1990's "go-to" show. The two other shows I mix and match with "A" and "B" sometimes. This current incarnation includes a "double-rope-through-my body" and the "Egg Can" effect, which I've re-worked to suit my style; I must admit, the advise given in professional kids'-show-magician David Ginn has heavily influenced the construction and routines of my kids' shows; I was thrilled to meet David in the 1980's at a magic get-together in Winnipeg; he even autographed one of his books that I owned, "Magic and Monsters For Kids I Love", just one of many which he's written! Regardless, something went very wrong with the "Egg-Can" effect tonight, unbenounced to the audience. Suffice it to say that an egg that I had supposedly pre-blown empty wasn't completely hollow, making for a sticky and stinky mess! The kids didn't notice anything unusual, thankfully, so the outcome was as it should be, but that's not the first time I had bad luck with an egg: in the 1990's, at "Lord Gort's Medieval Feast" in Winnipeg, a whole egg that I had hidden in the front pocket of my white pants had broken just before my segment! The effect involved a silk handkerchief transforming into an egg, so the egg was a crucial part of the trick! I quickly drove home (which was minutes away, thankfully) and changed my pants, securing a brand-new egg. After that, I always performed that effect with a fake egg. 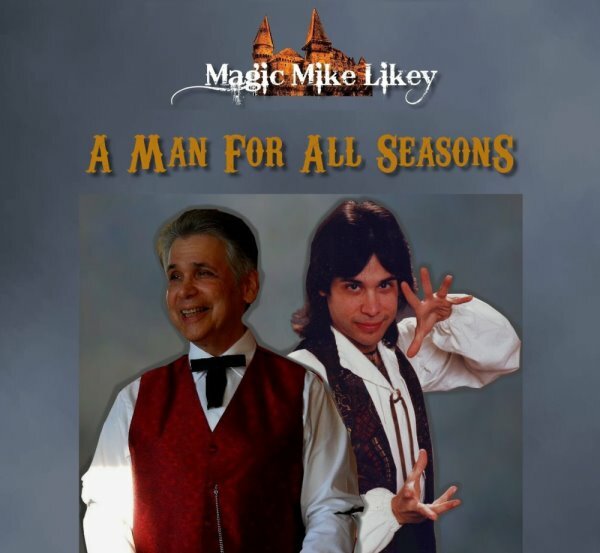 The point of this is, that we as magicians have an advantage over, say singers and musicians; the audience knows what the particular song is supposed to sound like, but they don't necessarily know what to expect with a magic illusion! In other words, we can change our routine, or even the outcome of the trick, without them even knowing that something might have gone wrong! Believe me, I've had to do this on several occasions, without batting an eye. One friend of mine, a famous television "escape artist", early in his magic career in Winnipeg, apparently produced a deceased dove from a fire-pan, while another gold-medal-winning Winnipeg magician, while attempting to secretly vanish into his coat-tails a dove, missed, sending the bird careening quickly in reverse to its early demise, smashing against a nearby wall! No doubt everyone was horrified; our mutual agent related these stories to me, in an effort to make light of me forgetting my bunny at home, which in the "spectacular" climax of my show, I was to produce; you win some, you lose some! After that, Len Andree always teased me before a show, asking, "Did you feed your rabbit? He looks kind of skinny"